Most Christian children today have never seen their dad open a Bible to lead their family in a time reading and prayer. The idea of “family worship” is completely foreign in most Christian homes today. And even when their is a desire, very often parents feel inadequate or awkward. That’s understandable. 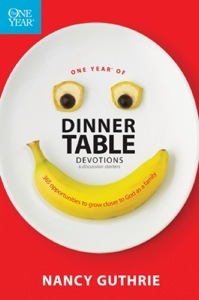 One Year Dinner Table Devotions is a great resource to help parents begin!